Following a 2+2 post, PokerTableRatings.com (PTR) discovered 10 PokerStars accounts being bots. These have been frozen by the online poker room upon evidence provided by PTR. PTR announced that, according to their investigation, the programs played around 8,320,000 hands in $0.25/$0.50, $0.5/$1 and $1/$2 no-limit games, generated a rake of $186,572 and a profit of $57,839 in total. The site based its assumptions on their own analysis of the statistics of the 10 accounts (7emenov, bakabar, crazier, mvra, nakseon, kozzin, demidou, koldan, Daergy, feidmanis) which showed more than suspicious similarities in the changing of stakes as well as “a unique and easily identifiable betting pattern from the big blind in unraised pots.” To see their full analysis, visit PokerTableRatings.com. If you are interested in poker, you probably come across news far and near about the setup of the final table of the WSOP 2010. Here I provide some intel on the players striving for the most coveted bracelet of the championship and the $8,944,138 prize. He is both the chip leader and the youngest player of the Nine, also delivering his best performance ever. Besides a 10th place in the 2008 EPT Prague €5,000 NLHE side event (€42,800), he made it in the money in two events of the WSOP this year, the $1,500 NLHE 6-handed (50th place, $5,724) and the $1,500 NLHE (15th place, $37,276). Duhamel originally intended the WSOP as a means of gaining experience and he wishes to play even more live games, especially EPT events. Although boasting a number of achievements, the top of his career is this year’s WSOP Main Event, similarly to several of his fellow ’Niners’. 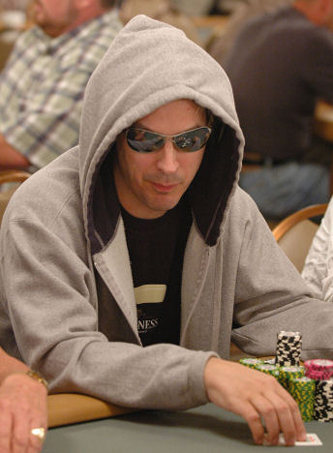 He used to work in a casino and also participated in the WSOP event for casino employees in 2007. He went ITM twice in the 2009 WSOP, and finished 32th in the $1,500 NLHE ($13,541) and 6th in the $1,000 NLHE ($82,804) this year. After two less successful WSOPs, Dolan is now amongst the best. He said he would analyse the style of the others and adopt his own accordingly. Poker pros Mike Matusow and Ted Forrest bet in May that Forrest, then weighing 188 pounds (85 kilograms), couldn’t get under 139 pounds (63 kilograms) by either 15 July or 15 September this year. Well, he could. WSOP 2010 is not kind to many of the big names, now including living legend Doyle Brunson as well. Although he made it to Day 2 six times out of eight tournaments he played, he couldn’t cash a cent. This short post is meant to be a thread-starter, I am curious about your opinion on this newly rising tendency, and also what accessories you have at arm’s reach when playing poker. I, personally, like to keep cool with a pair of Oakleys. This is mainly because of my lifestyle: I spend a lot of time in my room, and when it comes to going out, I tend to squint a lot in direct sunlight. My love for my sunglasses led me to try them at the poker tables, but I soon discovered it was more a disadvantage than an advantage. This was because poker rooms tend to be pretty dark already, and using the sunglasses made it a struggle to see what cards I was holding. North American Arms and Smith & Wesson both offering mini poker sets accompanied with revolvers are not just another ordinary item to add to your poker collection, but also can save you when things get tight on the poker table. Ever since people have been playing poker, players have been giving hole cards various nicknames. Here, I have collected some of the most known and popular nicknames for hole cards. World Series of Poker (WSOP) is the biggest and most prestigious live poker tournament series. It is organised every year and is held in the glitter strip of Las Vegas. As you may of you already know, if you win a tournament in the Series, you have the privilege to receive an elite bracelet. Maybe one of the biggest accomplishments of a poker player’s career is to win a bracelet. Some professional poker players believe that there are two types of poker players; those who have won a bracelet and those who have not. 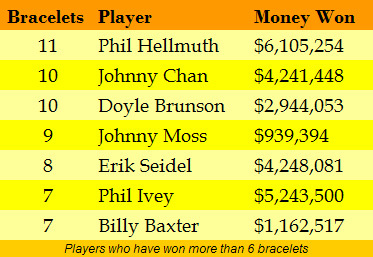 As of 2010 the majority of the bracelets have been won by the one and only tilting king, Phil Hellmuth. Johnny Chan, who also appeared in the cultic Poker Faces movie, has secured himself and impressive 10 bracelets. Johnny Chan, also known as the grandpa of all poker players had 2 of his collection of 10 bracelets earned by winning Main Events.